Vallabhbhai Jhaverbhai Patel, one of the six children of Jhaverbhai Patel and Ladba, was born in Nadiad, Gujarat. There is no record of his date of birth. The generally accepted date, October 31, 1875, of which the source is his Matriculation certificate, was chosen by Vallabhbhai himself while filling in a form. The family was an agriculturist one of the Lewa Patidar Community, and could in terms of economic status be described as lower middle-class. It was poor and had no tradition of education. Vallabhbhai’s childhood was spent away from books, in the ancestral fields at Karamsad. He was already in his late teens when he passed out from the Middle School at Karamsad and went to the High School at Nadiad, from where he matriculated in 1897. Even as a young boy Vallabhbhai displayed qualities of organization and leadership that marked him out for his future role. Once as a sixth-form boy he organized a successful strike of his classmates that lasted for three days to teach a lesson to one of the teachers who was unduly fond of the rod. Vallabhbhai must have inherited these attributes from his father who, it is said, had fought in the Mutiny under the Rani of Jhansi and was subsequently taken prisoner by Malhar Rao Holkar. Vallabhbhai was a mature young man of twenty-two when he matriculated. Owing to the impecunious circumstances of the family, higher education was not within his reach. The next best thing was to take a course in law and set up as a country lawyer. This he did and established a small practice at Godhra. But an attack of plague, which he contracted while nursing a friend, made him leave the town and after spending some time in Nadiad, he moved on to Borsad in 1902, a town in the Kheda district where at that time the largest number of criminal cases in Gujarat were recorded. Vallabhbhai became quite popular here as a defence lawyer. Vallabhbhai now wanted to go to England and qualify as a Barrister. From his practice at Borsad he had earned enough for his expenses there but owing to certain circumstances he was not able to make the trip at once. His brother Vithalbhai expressed his desire to complete his education in an English firm and Vallabhbhai readily acquiesced to this and even paid for his stay. His wife, Zaverbai, died early in 1909 after an operation for some abdominal malady. When news of the bereavement reached Vallabhbhai, he was cross-examining a witness in a murder case at Anand. With an impregnable composure for which he became known later, he did not show grief but went on with the cross-examination in hand. He finally sailed for England in 1910 and joined the Middle Temple. Here he worked so hard and conscientiously that he topped in Roman Law, securing a prize, and was called to the Bar at the end of two years instead of the usual period of three years. On his return to India in 1913, he set up practice in Ahmedabad and made a great success of it. He had ready wit, a fund of common sense and a deep sympathy for those who were the objects of the British officials’ wrath and were caught in the clutches of the law, which was not uncommon in the Kheda district. He came to enjoy a respected position in public life due to his eminence as a Barrister. He accepted Mahatma Gandhi’s leadership, having been tremendously impressed by the fearless lead that Mahatma Gandhi gave to right public wrongs. In 1917 he was elected for the first time as the Sanitation Commissioner of Ahmedabad. From 1924 to 1928 he was Chairman of the Municipal Committee. The years of his association with the Municipal administration were marked by much meaningful work for the improvement of civic life. Work was done to improve water supply, sanitation and town planning and the Municipality was transformed, from being a mere adjunct to the British rule, into a popular body with a will of its own. There were also calamities like plague in 1917 and famine in 1918, and on both occasions Vallabhbhai did important work to relieve distress. In 1917 he was elected Secretary of the Gujarat Sabha, a political body which was of great assistance to Gandhiji in his campaigns. The association with Mahatma Gandhi became closer during the Kheda Satyagraha in 1918, which was launched to secure exemption from payment of the land revenue assessment since the crops had failed. It took three months of intense campaigning that was marked by arrests, seizures of goods, chattels, livestock and much official brutality before relief was secured from an unwilling Colonial Government. Gandhiji said that if it were not for Vallabhbhai’s assistance “this campaign would not have been carried through so successfully”. The five years from 1917 to 1922 were years of popular agitation in India. The end of the war was followed by the Rowlatt Act and still further curtailment of individual freedom. And then followed the Khilafat movement with massacres and terror in the Punjab. Gandhiji and the Congress decided on non-cooperation. Vallabhbhai left his practice for good and gave himself up wholly to political and constructive work, touring villages, addressing meetings, organizing picketing of foreign cloth shops and liquor shops. Then came the Bardoli Satyagraha. The occasion for the Satyagraha was the Government’s decision to increase the assessment of land revenue from Bardoli taluka by 22 per cent and in some villages by as much as 50 to 60 per cent. Having failed to secure redress by other means, the agriculturists of the taluka decided at a Conference on February 12, 1928, to withhold payment of land revenue under the leadership of Vallabhbhai Patel. The struggle was grim and bitter. There were seizures of property and livestock to such an extent that for days on end, people kept themselves and their buffaloes locked in. Arrests followed and then brutalities of the police and the hired Pathans. The struggle drew the attention of the whole country to it. Patels and Talatis resigned their jobs. Government revenues remained unrealized. The Government had to ultimately bow before popular resolve and an inquiry was instituted to find out to what extent the increase was justified and the realization of the increased revenue was postponed. It was a triumph not only of the 80,000 peasants of Bardoli but more particularly of Vallabhbhai personally; he was given the title of “Sardar” by the nation. About this time the political situation in the country was approaching a crisis. The Congress had accepted its goal of Purna Swaraj for the country, while the British Government through their policy of pitting one interest against another and through constitutional tricks, were trying to stifle the voice of freedom and doing everything they could to reinforce their rule. The boycott of the Simon Commission was followed by the launching of the famous Salt Satyagraha by Gandhiji. Vallabhbhai Patel, though he had not committed any breach of the Salt Law, was the first of the national leaders to be arrested. He was in fact arrested on March 7, 1930 – some days before Gandhiji set out on the march to Dandi. He was released in June. By then Gandhiji, Jawaharlal Nehru and other leaders were in jail and the tempo of the struggle in the country was rising. In a few months Vallabhbhai was back in prison. In March 1931 Vallabhbhai presided over the 46th session of the Indian National Congress which was called upon to ratify the Gandhi-lrwin Pact, which had just then been concluded. The task was not an easy one, for Bhagat Singh and a few others had been executed on the very day the Congress session opened and delegates, particularly the younger sections, were in an angry mood, while Jawaharlal Nehru and Subhas Chandra Bose were not happy with the terms of the Pact. But the Congress finally put its seal on the Pact with one voice. Civil Disobedience was suspended, political prisoners were released and the Congress agreed to participate in the Round Table Conference. The Round Table Conference failed. Gandhiji and other top leaders were arrested and a policy of repression followed. Vallabhbhai Patel was lodged with Gandhiji in Yeravada Jail and they were together there for sixteen months-from January 1932 to May 1933. Vallabhbhai then spent another year in the Nasik Jail. When the Government of India Act 1935 came, the Congress, though generally critical of the Act, decided to try out those of its constitutional provisions that seemed to grant to Indians a measure of self-government and to take part in the elections for Provincial legislatures that were envisaged under it. In seven of the eleven Provinces, Congress majorities were returned and Congress Ministries were formed. Vallabhbhai Patel, as Chairman of the Congress Parliamentary Sub-Committee, guided and controlled the activities of these Ministries. Not for very long, however, for, on September 3, 1939 when Britain declared war on Germany, the Viceroy without consulting either the Central or the Provincial Legislatures, proclaimed India as having entered the war as an ally of Britain. The Congress could not accept this position and the Congress Ministries resigned. Gandhiji launched Individual Civil Disobedience opposing India’s participation in the war, and the Congress leaders began to court arrest. Vallabhbhai Patel was arrested on November 17, 1940. He was released on August 20, 1941 on grounds of health. Then the All India Congress Committee passed the famous Quit India resolution in Bombay on August 8, 1942, and Vallabhbhai, along with the other members of the Working Committee, was arrested on August 9, 1942 and detained in the Ahmednagar Fort while Gandhiji, Kasturba and Mahadev Desai were detained in the Aga Khan’s Palace. The Sardar was in jail for about three years this time. When, at the end of the war, the Congress leaders were freed and the British Government decided to find a peaceful constitutional solution to the problem of India’s Independence, Vallabhbhai Patel was one of the chief negotiators of the Congress. When India attained Independence he became the Deputy Prime Minister and was responsible for the Home, States and the Information and Broadcasting portfolios. It was in this capacity that he was called upon to tackle the most intricate and baffling problem of the States’ integration into the Union of India. And it is here that his tact, his powers of persuasion and his statesmanship came into full play. He handled the question as only he could have handled it, managing, in less than a year’s time, to reduce the Princely States from 562 to 26 administrative units and bringing democracy to nearly 80 million people of India, comprising almost 27 per cent of the country’s population. The integration of the States could certainly be termed as the crowning achievement of Vallabhbhai Patel’s life. But for him, this may not have been achieved easily and quickly. As Minister of Home Affairs, he presided over efforts to bring back order and peace to a country ravaged by communal strife unprecedented in its history. He accomplished this task with the ruthless efficiency of a great administrator. He sorted out the problems of partition, restored law and order and dealt with the rehabilitation of thousands of refugees with great courage and foresight. He reorganised our Services which had become depleted with the departure of the British and formed a new Indian Administrative Service, to provide a stable administrative base to our new democracy. While Gandhiji gave to the Congress a programme for a broad-based action, it was Vallabhbhai who built up the Party machinery so as to carry out that programme. No one before him had given adequate thought to the need of having an effective organisation, but Vallabhbhai realised this need during his campaigns and devoted his organisational talents and energy to building up the strength of the Party which could now fight in an organised and effective manner. His grip over the Party organisation was complete. Vallabhbhai Patel was thus one of the chief architects and guardians of India’s freedom and his contribution towards consolidating the freedom of the country remains unrivalled. 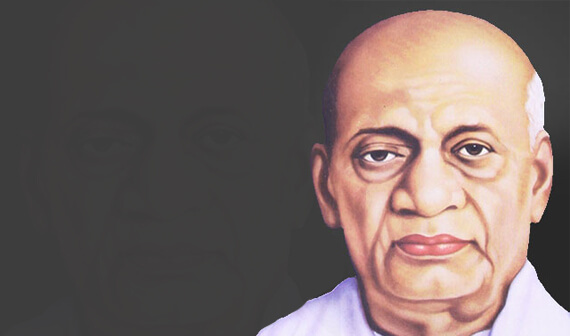 He died on December 15, 1950, leaving behind a son, Dahyabhai Patel, and a daughter, Maniben Patel.